“This government is at least better than previous ones,” remarked a 74-year-old Eritrean man to me last month in the Ethiopian capital of Addis Ababa, his longtime residence. Clad in a tattered grey suit and speaking to me in Italian, the man was peddling a book of useful Amharic phrases he had compiled for the foreign visitor, proceeds of which would go toward the purchase of a second-hand comforter for his bed. Although that particularly bloody epoch came to an end in 1991, many a resident of Ethiopia might nowadays still have cause to complain about homicidal activity by the state. In the Oromia region surrounding Addis Ababa, for example, there are claims that more than 200 people have been killed by Ethiopian security forces since November 2015, when protests broke out in response to the government’s so-called “Master Plan” to expand the boundaries of the capital by a factor of 20. This was no doubt a valid concern given the government’s established tradition of wantonly displacing Ethiopians in the interest of “development” – that handy euphemism for removing human obstacles to the whims of international and domestic investment capital. Comprising some 35 percent of the population, the Oromo are Ethiopia’s largest ethnic group and have regularly decried discrimination by the ruling coalition party, the Ethiopian People’s Revolutionary Democratic Front or EPRDF, which is dominated by ethnic Tigrayan interests. Politically motivated detention, incarceration, and other abuses have long characterized the landscape in Oromia, and the current protests have seen children as young as eight arrested. Even without the Master Plan, meanwhile, the government is doing a decent job of courting investors. As I traveled west from Addis Ababa toward Woliso – a journey of about two hours – I passed sprawling factory complexes, including one featuring a Turkish flag flying alongside its more indigenous counterparts. A January report by the Ethiopian News Agency outlines the government’s goal of luring Turkish and other investors to “priority areas” as part of an overall scheme to convert the economy from agriculture to industry-based. 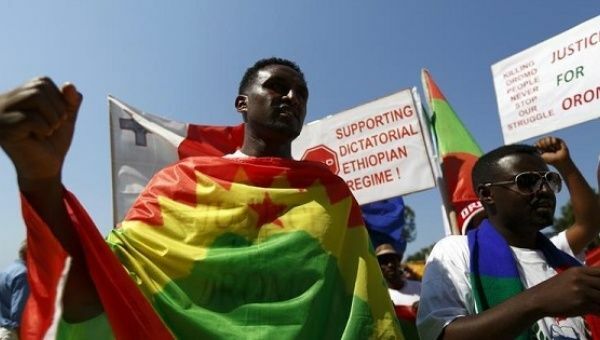 Noting that “about 110 Turkish investment projects have become operational” and that “incentives from the government includ(e) electricity and cheap labor,” the report highlights the exploits of the Ayka Addis textile factory 20 kilometers west of the Ethiopian capital, in the Oromia region. Launched in 2010 with a price tag of US$140 million, the Turkish factory is said to occupy several hundred thousand square meters of land. The website of the Ethiopian Investment Commission furthermore lists Ayka Addis as one of “a number of private Industrial Zones” in Ethiopia, described as “success stories.” The site, which advertises thousands of hectares worth of “investment opportunities” in the country, cites perks including exemptions from customs duties for machinery and other equipment as well as certain exemptions from income taxes. 200,000 people were reportedly in danger of trachoma-induced blindness in Oromia alone. All of this is merely to point out that, in the end, a lot of people in Oromia and beyond might have greater priorities than, say, income tax immunity for international developers. Because it doesn’t take a functioning eyeball to see that such development models are themselves in need of some serious development. *Belén Fernández is the author of “The Imperial Messenger: Thomas Friedman at Work,” published by Verso. She is a contributing editor at Jacobin magazine.